According to a report in the Times of India & many other newspaper reports, within minutes of the theft being reported, the entire hierarchy of Rampur police was at the crime scene. District chief superintendent of police Sadhna Goswami led the probe into the theft from the farmhouse in Pasiyapura village under Thanaganj police station of Rampur. A squad of sniffer dogs was also deployed to trace the stolen property…………….. incensed by the fact that such crime could occur, three police officials are facing transfer due to the incident……….. can you imagine what this is all about ?!?!?! The water buffalo or domestic Asian water buffalo (Bubalus bubalis) is a large buffalo. It is stated that water buffaloes were domesticated in India about 5000 years ago, and in China about 4000 years ago. Two types are recognized, based on morphological and behavioural criteria – the river buffalo of the Indian subcontinent and further west to the Balkans and Italy, and the swamp buffalo, found from Assam in the west through Southeast Asia to the Yangtze valley of China in the east. 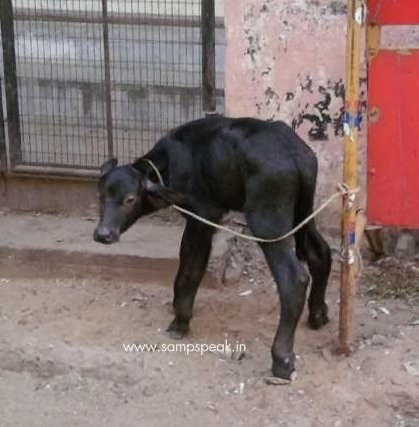 Murrah is a well known breed in India. Water buffaloes are especially suitable for tilling rice fields, and their milk is richer in fat and protein than that of the dairy cow. An online selling site shows Murra buffaloes costing from 26000 to 40000 depending on the yield from 6 litres to 14 litres per day. Miles away, the magnificent American buffalo was recognized as the official animal symbol of Kansas in 1955. A male bison can weigh over 1800 pounds and is 6 foot tall at the shoulder. Buffalo once roamed the American prairie by the tens of millions and provided a way of life. 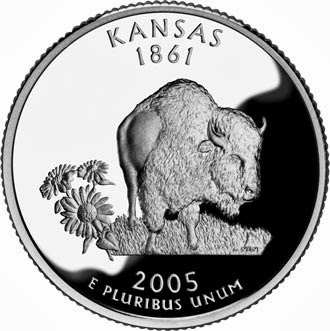 The Buffalo is also featured on the U.S. Mint's bicentennial quarter for Kansas, the official state seal, and the state flag of Kansas. 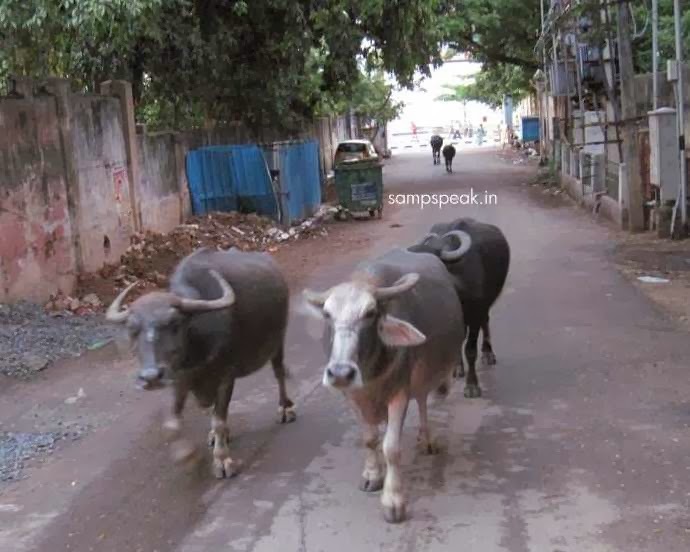 Now buffalo is in news……….because they were stolen and Police are on hot chase……….. no ordinary matter this as they belonged to Azam Khan, Samajwadi Party leader and a Minister in Uttarpradesh. The Police who were blamed, swung into action showcased their efficiency in Rampur district by solving the mysterious case of Cabinet minister Azam Khan's seven stolen buffaloes within 24 hours finding the stolen buffaloes. The minister's buffaloes had been stolen from the dairy of his farmhouse in Pasiyapura village on Saturday morning. The theft of 7 animals caused the entire police force on the run using sniffer dogs too. A police officer is quoted as saying that "due to the increased police involvement and extensive media coverage, the thieves got scared and abandoned the cattle". To ensure that the minister was not handed over some random cattle off the street, the cops even carried out an 'identification parade' in front of the farmhouse guard. Thankfully they were confirmed as "the same buffaloes that were stolen". Tidbit 1: the World’s first cloned buffalo calf was Samrupa, India’s answer to Dolly the sheep. But unlike Dolly, the first mammal cloned and who lived for seven years, Samrupa succumbed to a lung infection five days after it was born. Tidbit 2 : Nandanar or Bhakta Nandanar was a Tamil film directed by Manik Lal Tandon. It marked the film debut of the carnatic singer and stage artist K. B. Sundarambal. This was also the first film for Ellis R. Dungan. The film was released in 1935 amid great expectations from the public. It failed at the box office and received mixed reviews from the critics. Wiki states that Kalki Krishnamurthy made fun of it in Ananda Vikatan by claiming buffaloes and palm trees had acted well in the movie.